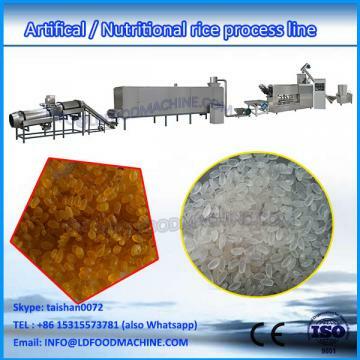 This instant artificial rice food processing equipment is highly automatic and energy saving. protein and minerals ,then by the twin screw extruder to puff and cook,it will be shape various rice again. The usage is same to natural rice ,but more sample and convenient than before.It not only is nutritional ,but also adapts to the fast rhythm of modern life. PLC control panel ,easy to operate and maintein. 1.De-stone machine : to remove the stone and other foreign matter. 3.Grinding machine : to grind rice to rice powder. 4. Raw material mixer: to mix various raw material evenly. 6.Twin screw extruder : to extrude and cook the raw material into different shapes rice . 1. If the raw mateial is corn flour ,wheat flour and other flour ,then the 1,2,3 step is no need. 2. If the raw material is broken rice ,its artificial rice processing line is as above. 3. The artificial rice production line also is a multi-purpose processing line. It not only can produce reproduced rice ,but also can produce various food ,such as pet food ,corn puff snacks food etc. How to produce different shapes artificial rice by our reproduced rice processing machine? 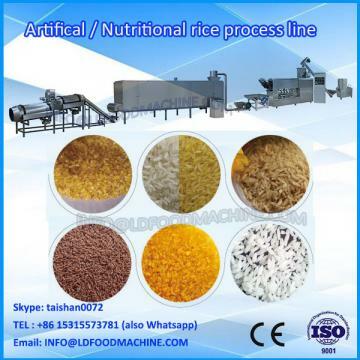 textured or fibre protein food,pet food,aquatic feed,modified starch,bread crumbs and other DG Twin screw extruder instant artifcial rice production extruder machine line China supplier hot sale online price.